Had an early morning light show going on outside around 5:30. We got hit fairly hard by a thunderstorm and some high winds passing through. Had about 15,000 people without power for a while in the area, ours stayed on. Lot of wind, rain, and thunder. After breakfast went outside and had to pick up a lot of limbs and branches in the driveway and yard. Then got the leaf blower out and cleaned around the driveway and house. Our neighbor had a good size tree come down in his backyard, it missed their house though. Got all that done and went inside to get a few things done. I had finally bought some furniture coasters so I spent the rest of the afternoon getting them under all the living room furniture, should have done that a long time ago! Makes it so easy to move the furniture. For dinner tonight it was Meatless Monday! 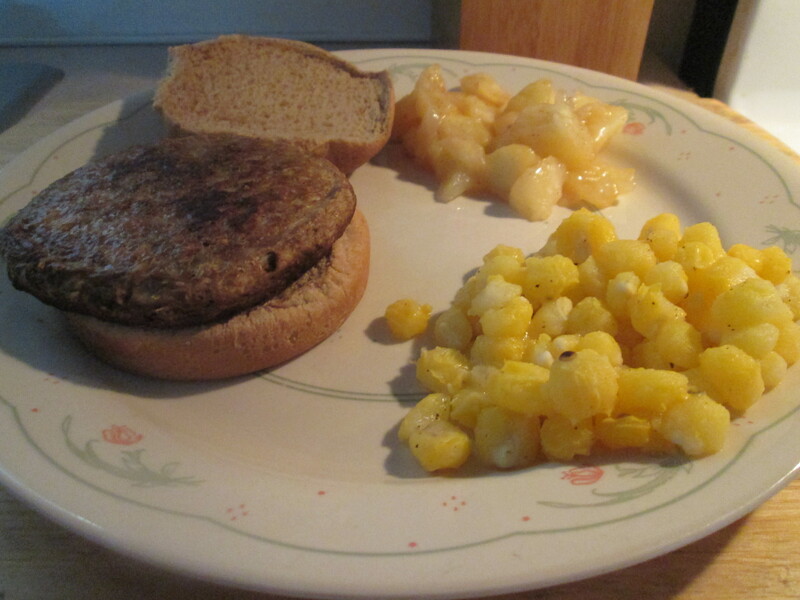 I prepare a Quorn Meatless Gourmet Burger w/ Golden Hominy and Harvest Apples. Well I decided to “Meatless” again. I had bought a box of Quorn Meatless Gourmet Burgers at Kroger and have them in the freezer. 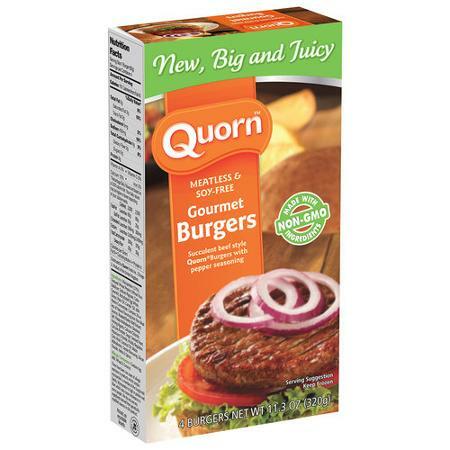 Second time I’ve had them, Quorn Brand Meatless Burgers. I just fry them in a 1/2 tablespoon of Extra Virgin Olive Oil for 4 minutes a side. Nice char on both sides and good flavor. They’re a nice alternative to the normal Meat Burger. Burger was moist and very good seasoning, I added Sea Salt and Ground Black Pepper to it. Plus the Burger is 110 calories and 7 net carbs per Burger. I served it on a Kroger Lite Wheat Hamburger Bun, which is 80 calories and 15 carbs. For side dishes it was all leftovers from last night. I reheated the Kroger Brand Golden Hominy. 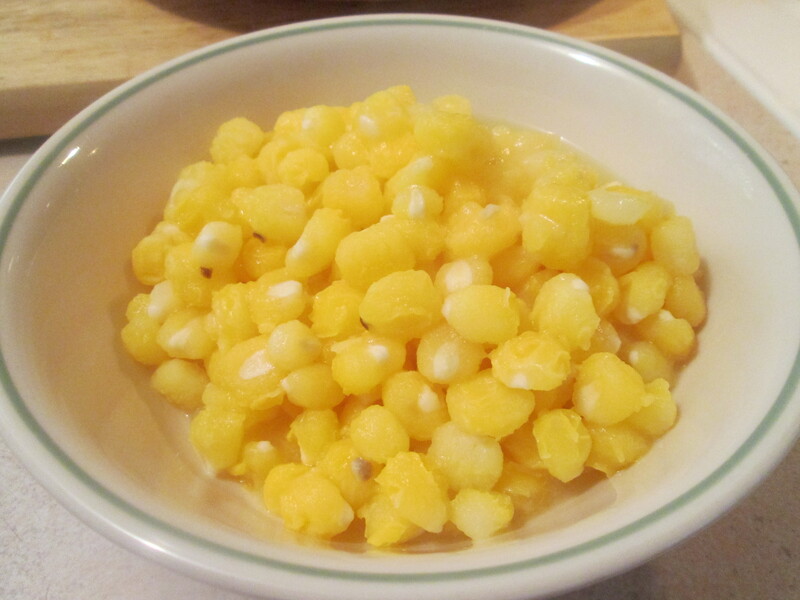 For those that has never had or heard of Hominy; Hominy is a food made from kernels of corn which are soaked in an alkali solution of either lime or lye. The corrosive nature of the solution removes the hull and germ of the corn and causes the grain itself to puff up to about twice its normal size. My favorite is the Golden Hominy. Since trying this a while back it’s quickly become on of my favorites. Then for another reheated side dish. 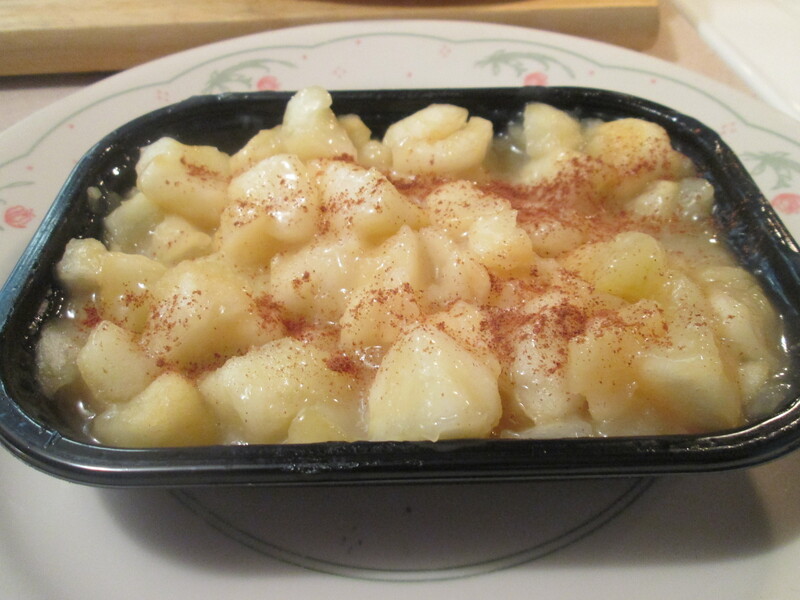 I heated up the leftover Stouffer’s Harvest Apples. An easily prepared way to get a delicious and savory Apple Dish. Easy to prepare; It comes in a microwavable tray. Microwave on high for 6 minutes, let cool and serve! This is a good one to have in the freezer! For dessert later a bowl of Del Monte Sliced Peaches. Facing an unpredictable economy, eating out is becoming less and less of an option. Choosing Quorn all natural, meatless, soy-free foods helps you save the money you would normally spend taking the entire family out to eat and lets you enjoy the endless delicious possibilities of healthy, low calorie food substitutes of foods you already love in the comfort of home. Quorn meat-free, soy-free products deliver great taste, fantastic quality and a wide variety of items to meet the demands of busy people with on-the-go lifestyles. They are perfect substitutes for those who seek healthy, low-fat, low calorie alternatives to meals like chicken nuggets, patties and cutlets, meatballs, turkey and Burgers more. The taste is so close to the real thing, and the recipe/cooking options are unlimited for creating nutritious, gourmet meals that the transition will be a no-brainer. Grill or microwave to reap the benefits of unforgettable flavor. 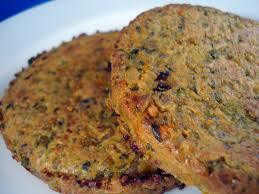 Quorn Gourmet Meatless Burgers are delicious soy-free meat alternatives, made from Non-GMO ingredients. Started my day off with a Healthy Life Whole Grain English Muffin topped with Smucker’s Sugarless Blackberry Jam, along with my morning cup of Bigelow Decaf Green Tea. In the morning its garbage day so today is clean the fridge out day, use the leftovers or loose them! Then went in and straightened the pantry, didn’t take long though. From there broke out the vacuum and the duster, house cleaning time. With keeping with the ‘Meatless Monday” theme, for lunch I had a salad with Kraft Free Catalina Dressing. Mostly cloudy and a bit humid outside with more rain on the way. For dinner tonight, it was Meatless as well. 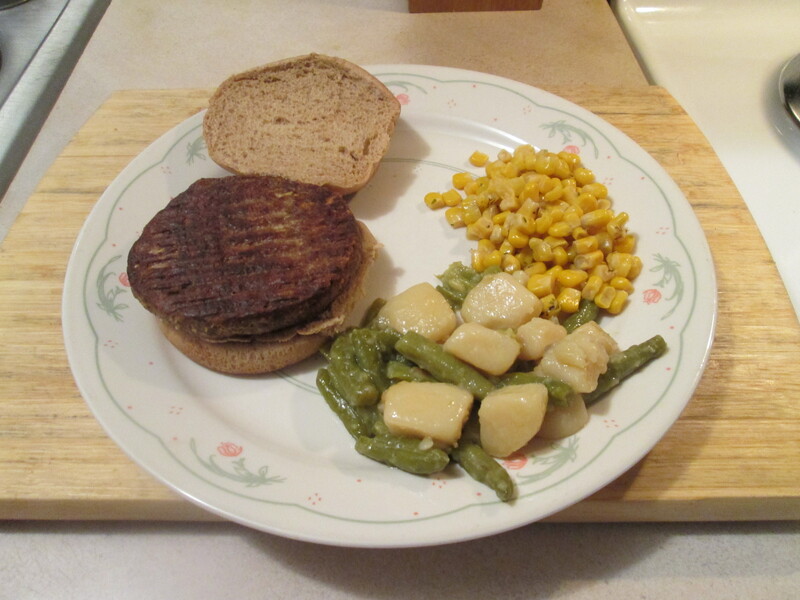 I prepared a Quorn Meatless Gourmet Burger w/ Cut Green Beans & Potatoes and Whole Kernel Fire Roasted Corn. Well I decided to go “Meatless” myself on this “Meatless Monday”. Last week I bought a box of Quorn Meatless and Soy Free Gourmet Burgers at Kroger so I’m going with a Meatless Burger tonight. First time I’ve tried the Quorn Brand Meatless Burgers. I fried it in a 1/2 tablespoon of Extra Virgin Olive Oil for 4 minutes a side. Nice char on both sides and good flavor. They’re a nice alternative to the normal Meat Burger. Burger was moist and very good seasoning, I added Sea Salt and Ground Black Pepper to it. Plus the Burger is 110 calories and 7 net carbs per Burger. I served it on a Kroger Lite Wheat Hamburger Bun. For 1 side I opened up a can of Del Monte Cut Green Beans & Potatoes and heated them up in a small sauce pan. 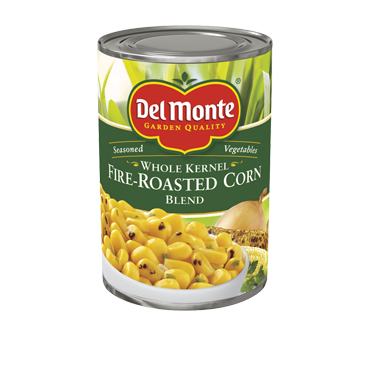 Then for another side I opened a can of Del Monte Whole Kernel Fire Roasted Corn Blend. First time I tried this one and loved it! Heated it up as the other Del Monte Product, small sauce pan and heat. It’s been a very good Meatless Meal tonight. For dessert later a Jello Sugarless Dark Chocolate Pudding. Quorn meat-free, soy-free products deliver great taste, fantastic quality and a wide variety of items to meet the demands of busy people with on-the-go lifestyles. They are perfect substitutes for those who seek healthy, low-fat, low calorie alternatives to meals like chicken nuggets, patties and cutlets, meatballs, turkey and more. The taste is so close to the real thing, and the recipe/cooking options are unlimited for creating nutritious, gourmet meals that the transition will be a no-brainer. Grill or microwave to reap the benefits of unforgettable flavor.